You’ve seen these collapsible water bottles before. Usually they are thinly lined flat plastic bottles. However, the new Neoprene Flexi-Bottle is a little different. It’s the same flexible, foldable water bottle that you’ve seen but this one has a neoprene sleeve that covers the PE pouch. Therefor it keeps your drink colder longer. It holds 13.5 oz, has a push/pull cap and a handy carabiner. It comes in your choice of colors: red, blue, black or lime. 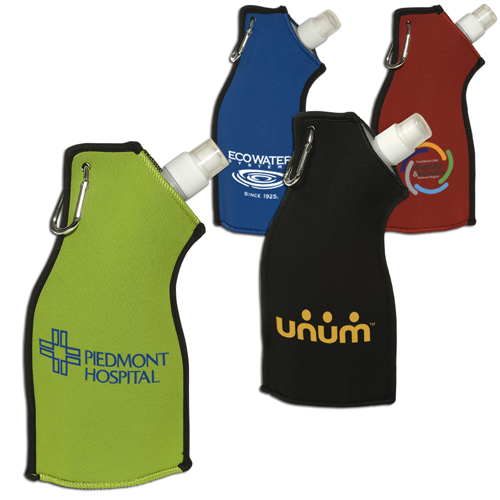 Each includes a 1 color imprint to display your logo. I think this is a great promotion for any business. It can be used by receivers in so many ways. Leave it in the office, in your handbag, backpack or car. I would love to have one of these to bring to the gym. It’s a water bottle that I can store in my glove compartment, then when I get to the gym I can fill it up at the water fountain. It’s all about space. Not taking up too much of it, that is. The Neoprene Flexi-Bottle folds flat when not in use so that you can easily store it in your suitcase or backpack. This is especially great now that airlines charge for luggage, so the more space you can save the better. Also great for outdoor events, walking or hiking. What is your favorite type of sports bottle? What are your thoughts on the Neoprene Flexi Bottle?